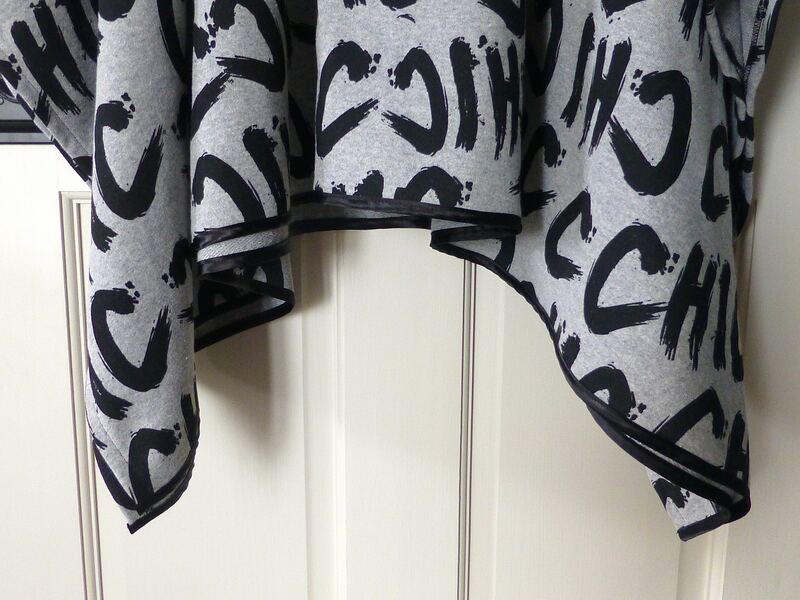 This is my first post as part of the Minerva Crafts Bloggers Network, and this is what I chose for my first make – a bold print Poncho with a cosy cowl neck, perfect for this time of year. If you’re anything like me, you’ve probably got your fingers in several pies and have lots of projects on the go at any one time, many of which are time-heavy and are completed over the course of weeks or even months. Occasionally, just occasionally, I get impatient and don’t want to add yet another row to a seemingly unending WIP. Once in a while I feel the need to make something quickly, to achieve something within a couple of hours, to finish something. Well this is just such a project. In fact it is such a satisfyingly speedy make that it can be whipped up in just one hour! 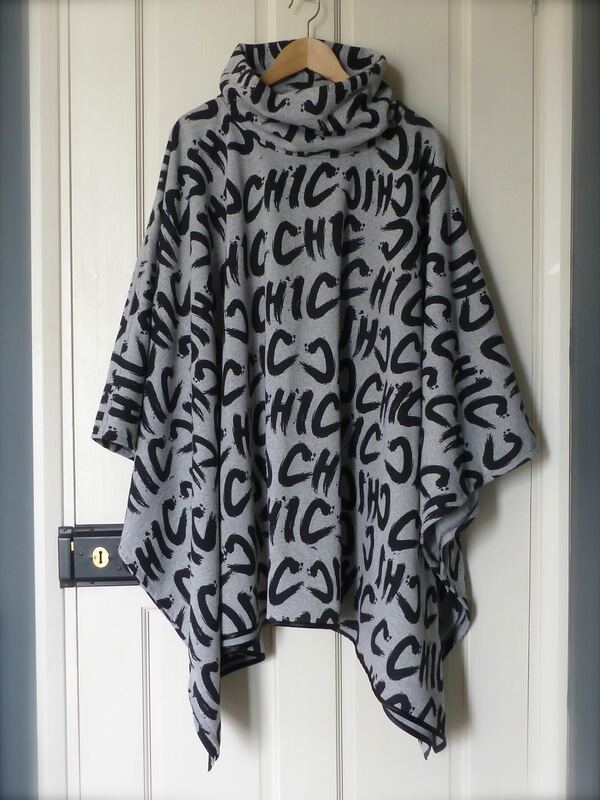 Other than speed, the inspiration for the poncho came from browsing the huge range of fabrics available at Minerva, and happening upon this bold “Chic” print which I thought had a touch of the Parisienne about it – isn’t it fantastic? 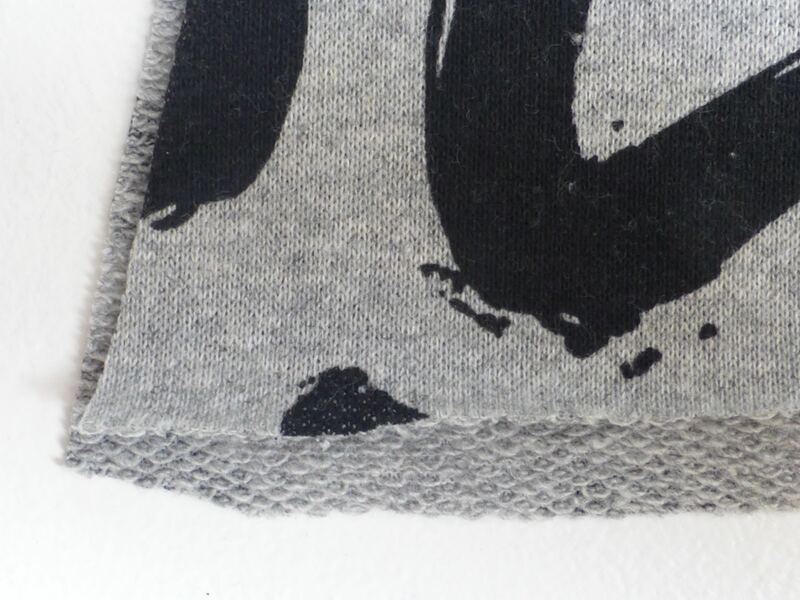 Please don’t be put off by the word ‘sweatshirt’ – it’s such good quality that it looks deceptively like wool from a distance, the benefits being that it is cheaper and easier to wash.
I’m not a hoodie kind of gal, so I searched for a poncho pattern and found McCall’s 6209 which is half price at the moment, and decided to make view ‘E’ with a cowl neck to keep those chilly winds out. I’ve actually got a knit poncho that looks exactly like the one illustrated and I wear it all the time in place of a jumper. It’s not substantial enough to replace a coat though, so I wanted to choose a warmer fabric which drapes loosely for comfort and the jersey does just that. I made the cowl up as per the instructions. The fabric has a lovely weight to it that stops it flopping too much. 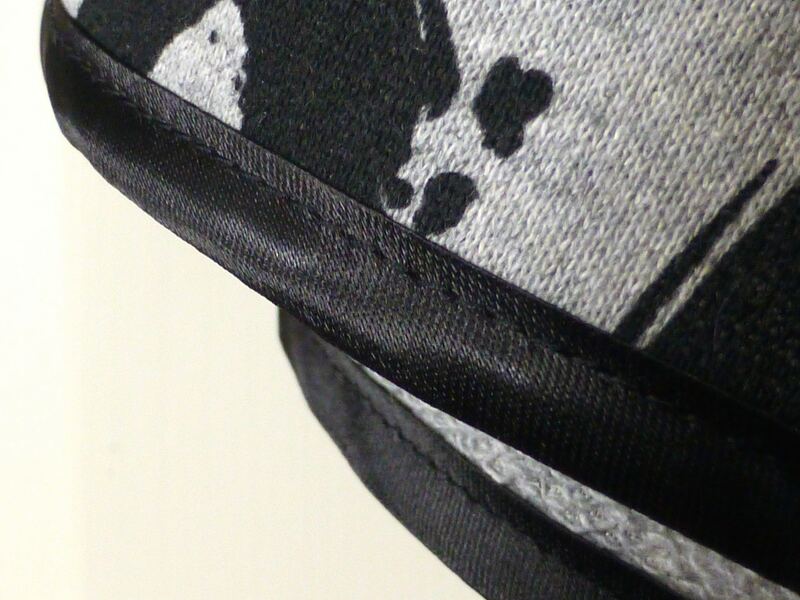 The top stitching around the neck edge looked so nice that I decided to stray from the directions a little and top stitch from the shoulder to the arm too, on either side of the seams. 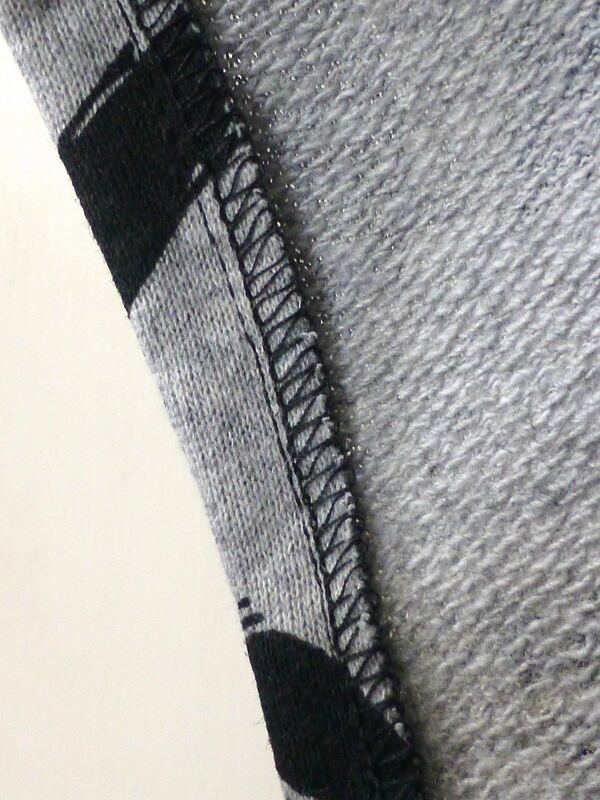 I overlocked the raw edges before hemming them as a double-turned hem would have been too bulky in this fabric. I meandered a little further from the instructions when I also decided to add some satin bias binding all around the lower hem. 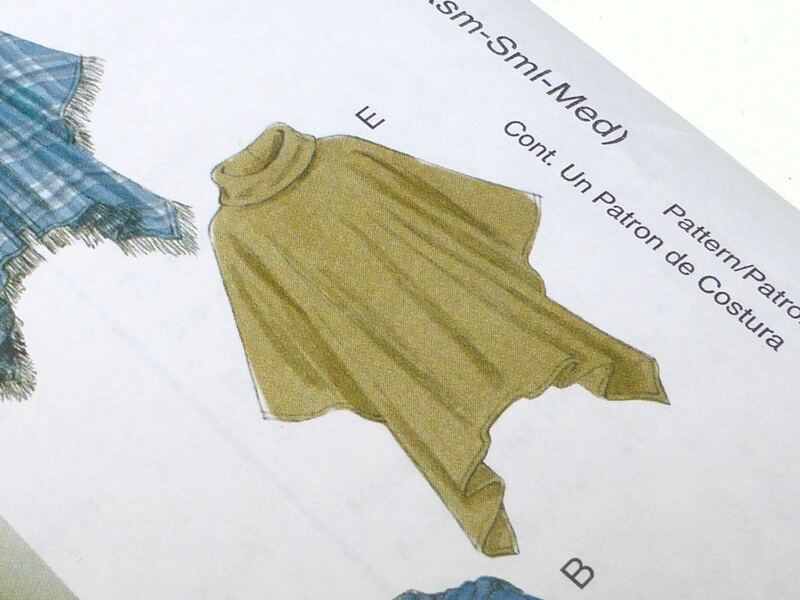 This addition creates a more professional finish and the sheen of the satin adds a luxury edge to the poncho. 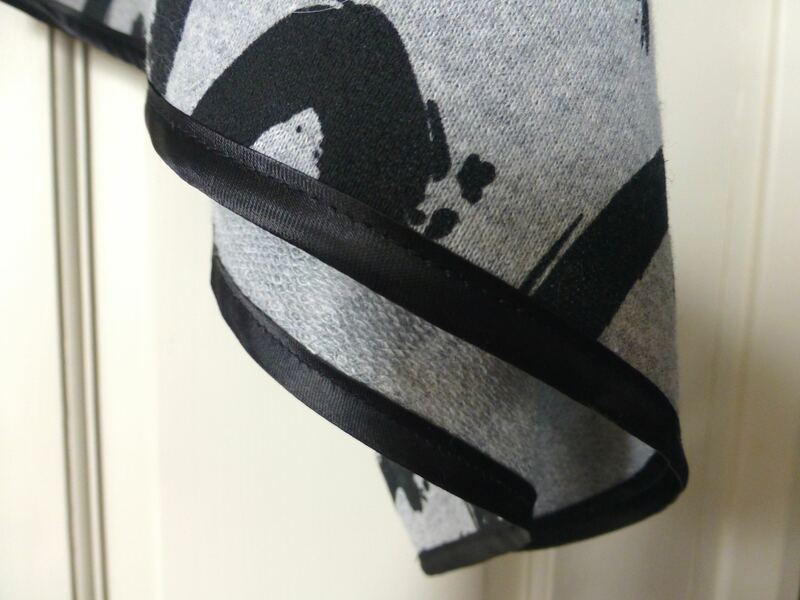 I’m so pleased with the bias binding, I wish I’d ordered more and done the armhole edges too, instead of hemming them. So, one and a half hours later (due to the extra embellishments) all it needed was a cold, windy day to test it out and, being in good old Blighty we are not short of those! 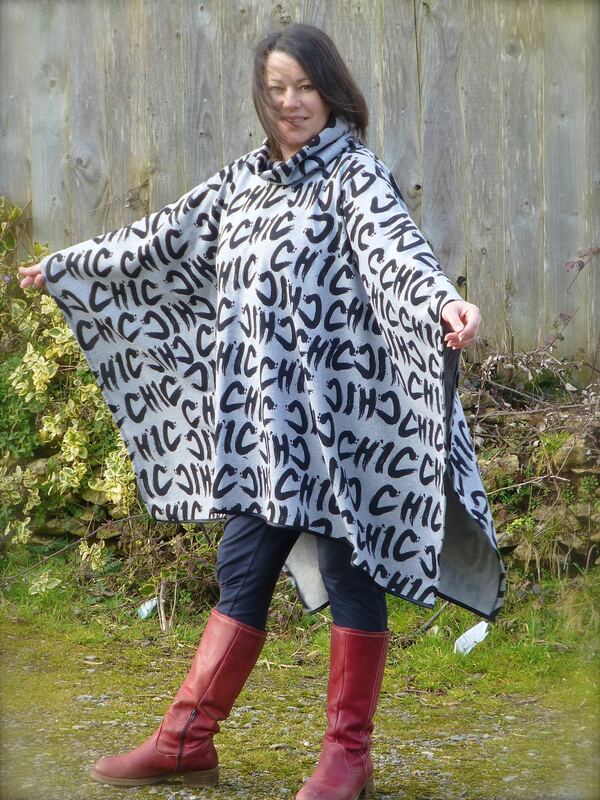 I had no idea the poncho would cause such a stir though and I’ve already had loads of compliments. I suppose it is pretty unique and that in itself will draw comments. 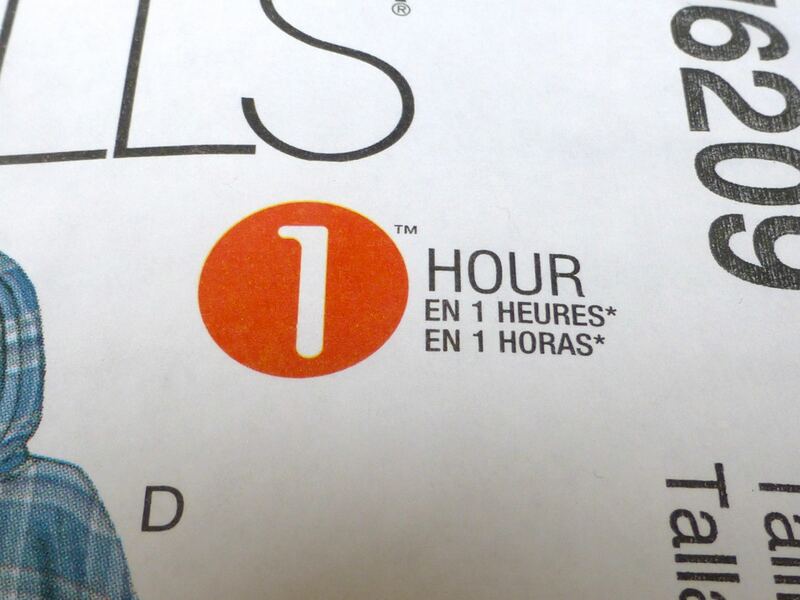 Do you ever get the urge for a quick make? What have you created in just a couple of hours? 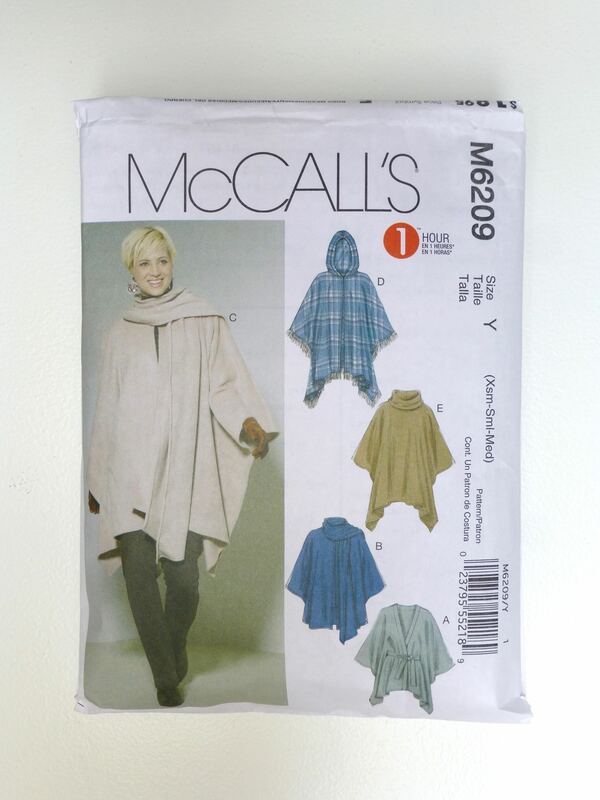 Categories: Minerva Craft Makes, Sewing | Tags: cowl neck, jersey, McCalls, Minerva, poncho, sewing, sweatshirt | Permalink. Gorjuss!! 🙂 [You have to say that with a Kiwi accent] I like the pattern and the fabric and LOVE things that make up in an hour and a half! As usual, I have deleted your comment on my post about the topdown progress, sorry…. but I remember what you have written so…. if you had knitted both the front and the back sides, why not to knit the rest? If you have enough yarn, just make the sleeves… Your photos are gorgeous and so colorful! I have to learn from you ! I have plenty of yarn and it is a polo neck so I suppose I should make the sleeves otherwise it might look a bit odd. I am a Wedding Photographer by trade, more used to taking portraits than still lifes, but I am getting there. Thank you for noticing my efforts! PS all my urges are for quick makes, it’s takes a huge amount of effort to slow down. I once cut a dress out before my shift started at 8am, sewed it up in my 37.5 minute break, and wore it to go out that evening! Think that’s my quickest! Wow, your parcel has just arrived – there’s so much in it! A bit of everything is absolutely perfect for the makes I have in mind for everyone so, on behalf of Comic Relief, a huge “Thank You”! Your welcome! Sorry it was a bit rushed wrapping it up. He he, they’re a rather gorgeous shade of raspberry and I wish I’d bought two pairs at the time because these are nearly worn out! Wow, I love this! What an easy to make, easy to wear-perfect! And the bias binding really lifts it to so etching more special. 🙂 My big, Winter, duvet coat has exactly the same effect! I love that you made the most of the fabric’s design. The satin binding finishes it off so nicely. You couldn’t get lost in a crowd! The print is awesome! 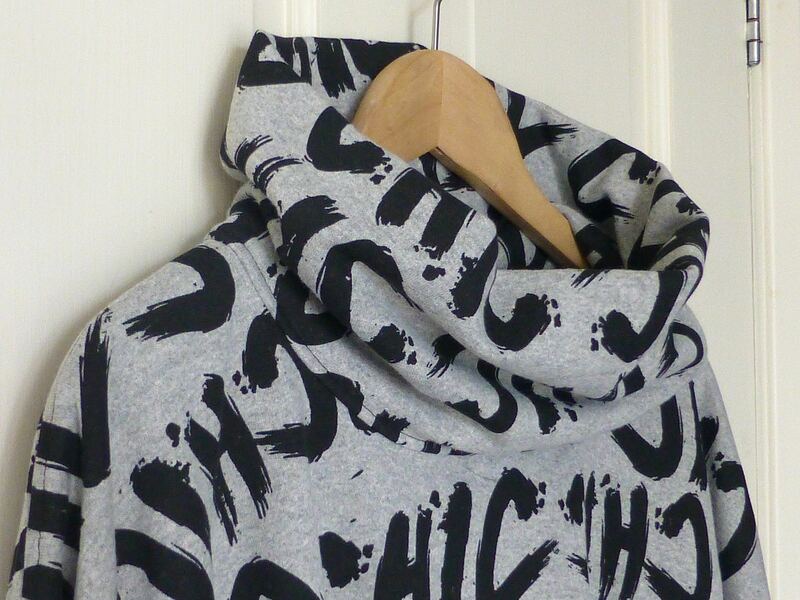 And I love that it’s a “classy sweatshirt” material, too! 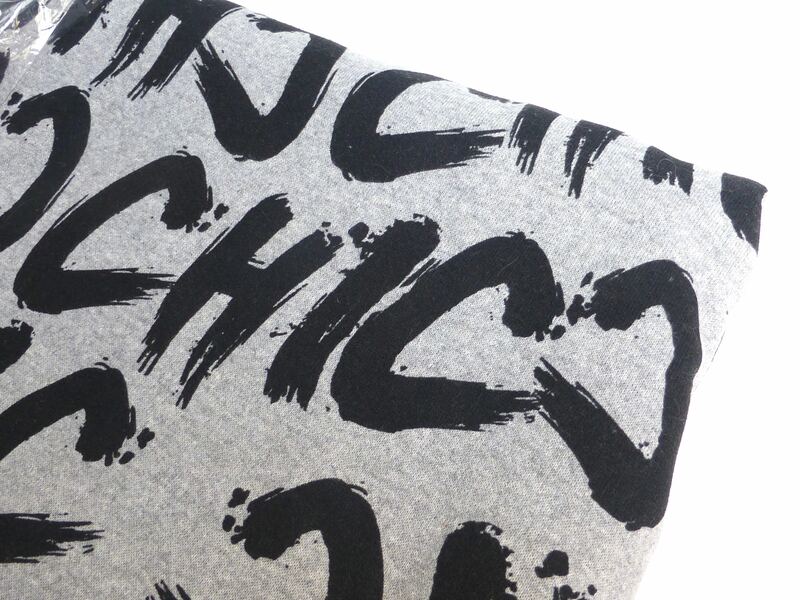 Warm, yet stylish! Thank you! At the moment I’m wishing I made it out of PVC to keep me dry in all this rain….. 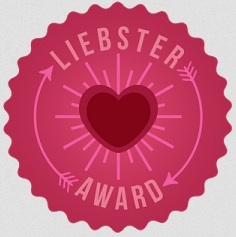 Thank you – I am really pleased with it and it really was that quick to make! I love this! I love the black trim. It looks like leather from afar! I’m hoping the need for a poncho doesn’t continue too much longer but we’ve probably got a couple of months in which this will be very useful, to go yet! I know what you mean; it’s the slight sheen that does it. I think I’ll get a lot of wear from it all year really, as it’s the kind of thing you can just chuck on if you’re sat out late on a summer evening too. 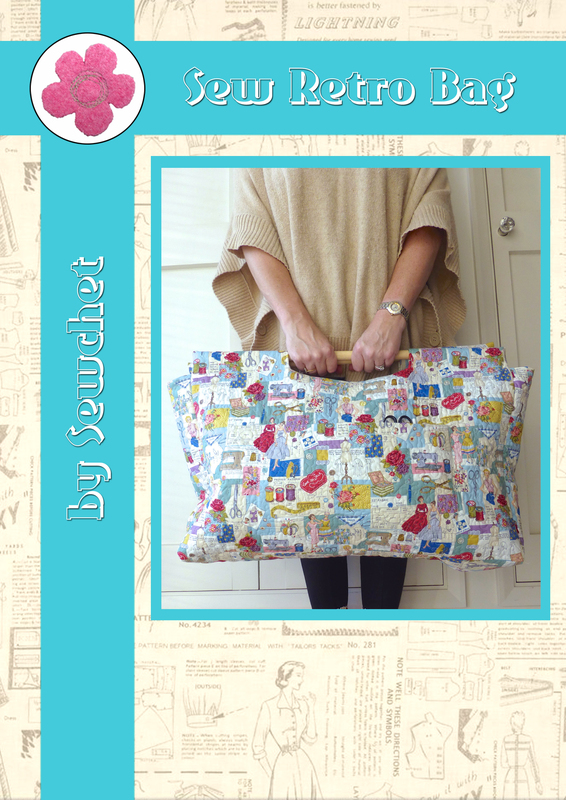 Lovely work and the binding really gives the poncho a professional finish! 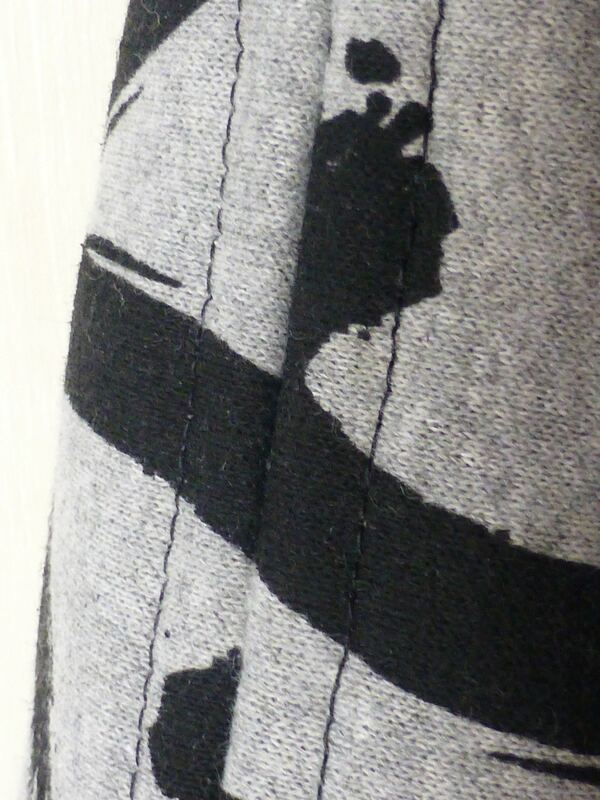 It’s gorgeous, and so handy to throw on when you’re heading out the door. Looks so comfy!